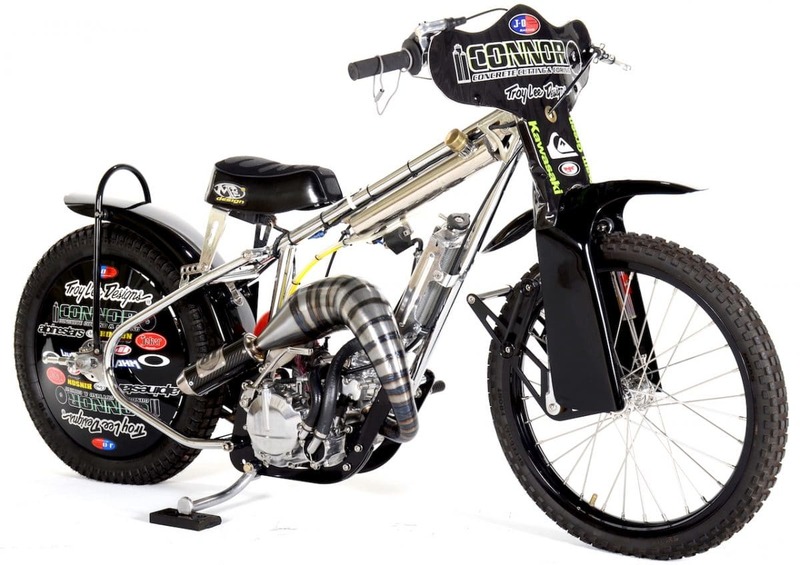 A one-off machine built by speedway world champion Bruce Penhall for his son Connor Penhall is our main focus on this week’s Two-Stroke Tuesday. 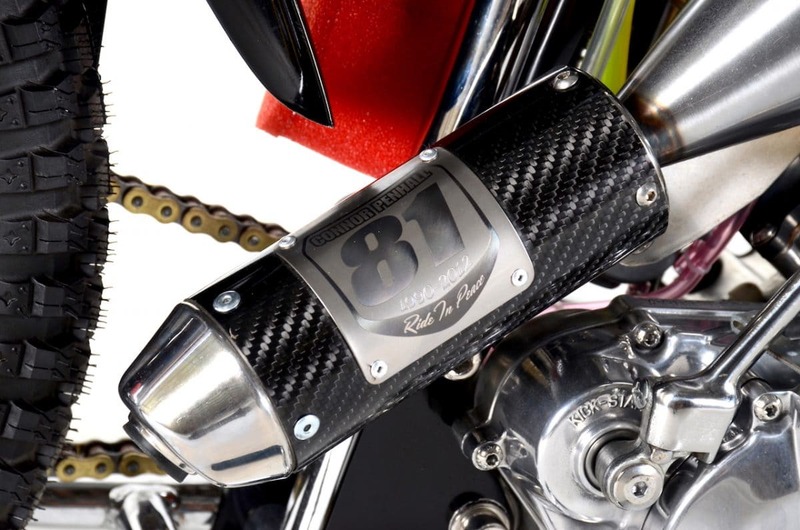 We have a new product from Ride Engineering featured in 2-Stroke Hardware and we let two-stroke fans world wide know where they should be this weekend. 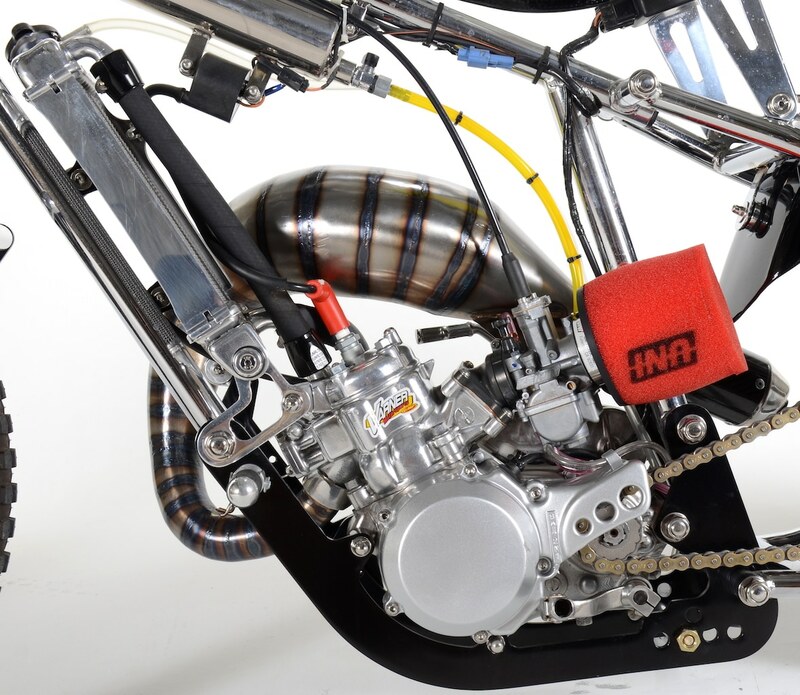 We have four different two-stroke videos in 2-Stroke Theater for your viewing enjoyment. If you like the custom build this week check out the exclusive link at the bottom of this post to another insane project. 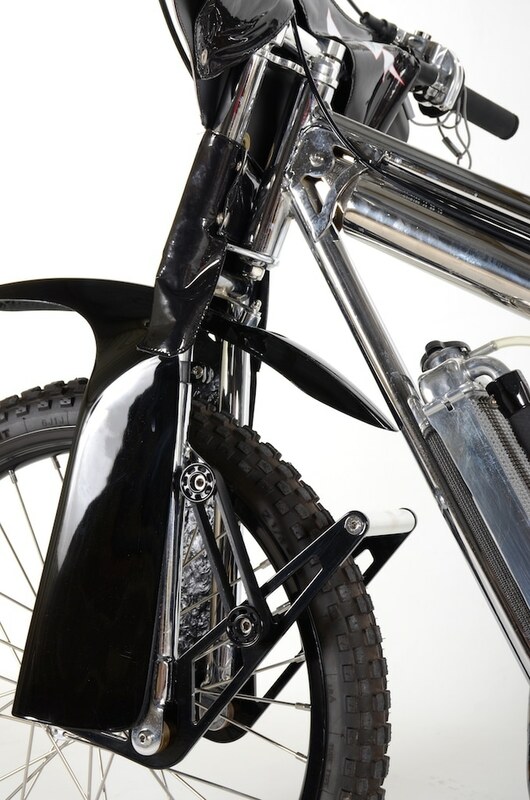 The original bike was built for Connor in 2001 when he wanted to give speedway a try. Andy Johnson and Donnie Odom sponsored Connor and he raced a few local races but gave up the Speedway racing because of his passion for motocross and off-road. 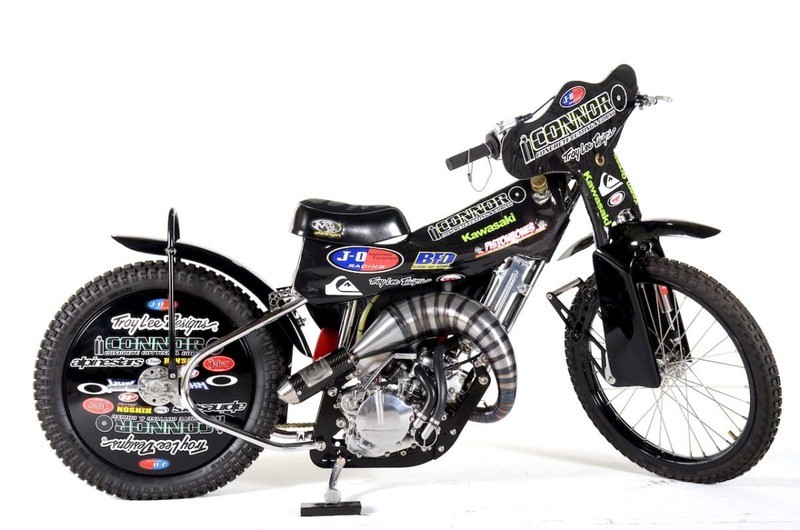 After Connor passed away, we wanted to track down his old speedway bike, restore it. The bike is on display in the Connor Concrete Cutting office to give everyone a little reminder of his passion for two wheels. That long cylinder looking piece is actually the gas tank. Naked this is what the bike looks like. Chassis was built by a gentleman named Robin from Sweden. Speedway racing in Sweden is practically a religion. The fork set up is wild! Those rubber band looking pieces provide small amounts shock absorption . 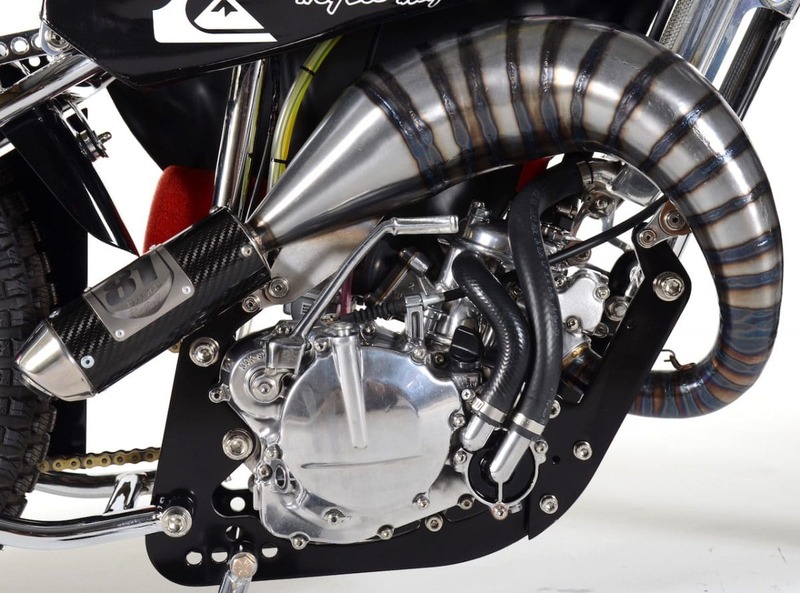 KX85 power plant with a ton of bling. Just a little reminder of CP81. Connor’s bike was restored by Rodd “Sledge” Saunders. This new Bar Mount has a one-piece top that is designed to resist bending much better than the stock bar mount with and adjustable plate that will hold a Scott’s or GPR steering damper. Bar mount height remains the same as stock and the bar position can be adjusted forward or back. 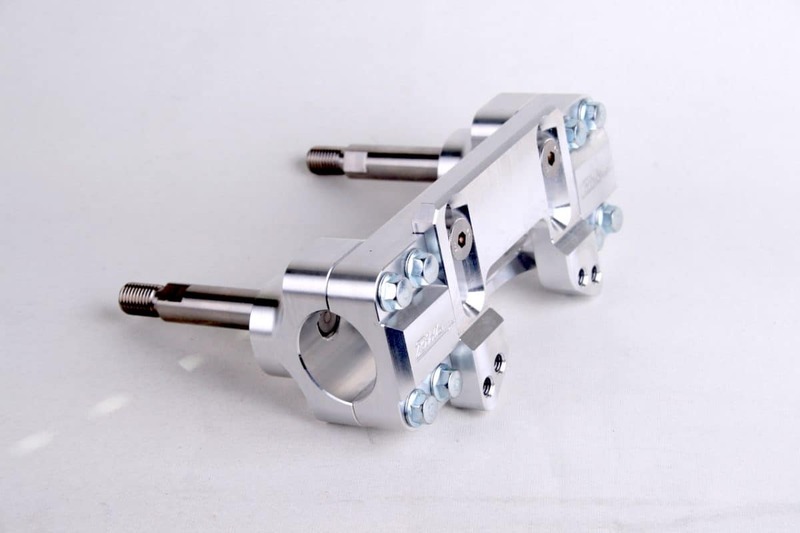 Precision machined from aircraft quality aluminum, there is a 6mm difference between the forward and back mounting positions. We also machine our own stainless steel posts that prevent over tightening, unlike the cheap bolts used by other competing brands. Posts can be unscrewed and replaced if bent. 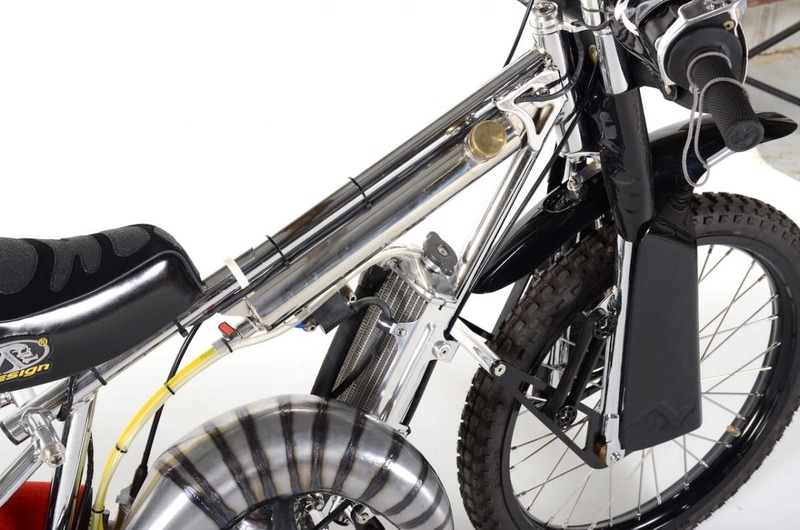 If you’re a 2 stroke fan and live in the UK, and even if you don’t, you should be in North East of England this weekend, because the 2018 Apico 2-stroke championship in association with DEP Pipes powers into action! 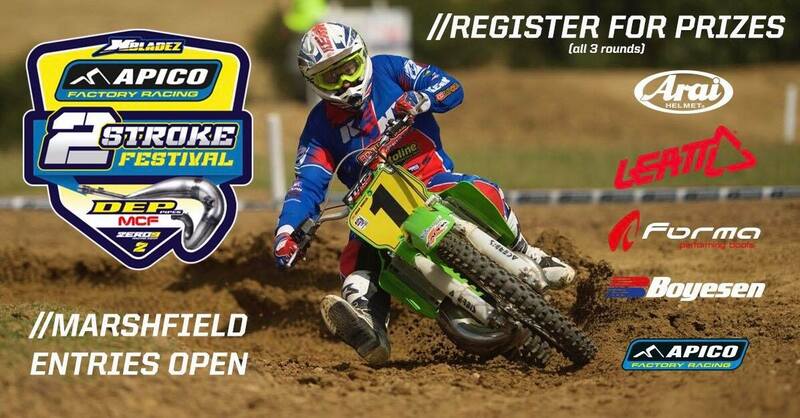 The three rounds series, which is the brainchild of 2-stroke guru Dave ‘Ironman’ Willet is all set for some great race action at the new Ironworks MX track near Middlesbrough this weekend 7/8th July. The Ironworks track is an fantastic venue for any motocross racing, but in particular 2-stroke action with nice flowing design, wide corners and good soil, and the track crew has been right on it with the watering in this hot weather. It’s going to be a fantastic weekend of motocross action like 2-strokes always seem to deliver. With classes for most level of riders, all on 2 strokes of course, it’s the place to be if you’re a 2-stroke fanatic like the series promoter and former 2-stroke British champion Willet. With round 2-scheduled for Sillindge, Kent on 4/5th August and the final round TBC after the postponed opening round that was scheduled for Marshfield, it’s not too late to get entered and get racing. The following classes are as follows. There’s also a new schedule for 2018 as the series goes from a one off event to a three round series. Qualifying and three blocks on Saturday and two blocks and prize giving on Sunday making sure that all riders get a full weekend of bike time! Although we ask you to enter as Fast or Faster the qualifying will confirm your group for the three round series. If you want to get involved and race the series click here on this MCF link to sign up. And for regular updates just find the Apico 2-stroke Facebook page @Twostrokesforlife where you’ll find plenty of photos and videos. Get on it people and kickstart your heart! If you like the custom 2-Stroke build on this week’s Two-Stroke Tuesday then you won’t want to miss this 2018 CR500AF build we did earlier this year. Click the image below for more.